Oats are well-tolerated on the low FODMAP diet (hooray). See here. Oats unfortunately are not gluten free, they naturally contain gluten. Certified ‘gluten free’ oats according to Coeliac Australia are oats free from contamination of wheat, rye and barley, but still contain naturally occurring gluten. Read more here. 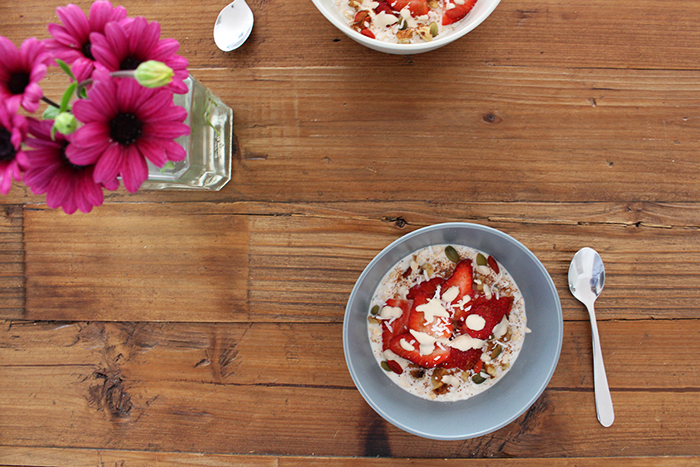 Read here for Coeliac Australia’s stance on Oats & the Gluten Free Diet. Now the fun stuff… If you have been following Friendly Little Kitchen for awhile now, you may have noticed my deep love for pancakes! A quick scroll through my Instagram account would tell you I eat them quite often, however, it is quite the contrary. Pancakes (and let’s not forget waffles) are mostly reserved for a Saturday or Sunday morning where they can be slowly and lovingly prepared and every mouthful savoured. Whilst I would love everyday to be pancake day, the reality is on workdays I’m reaching for something pretty quick, easy and healthy, BUT still delicious! 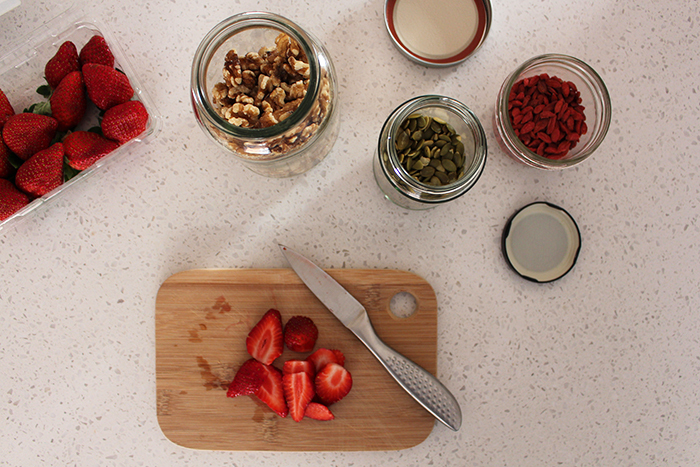 My solution is simple, overnight oats – the ultimate weekday breakfast. Overnight oats, or bircher, is a hard one to get wrong. Oats and milk go in a bowl and in the fridge, and are left overnight. Simple. Of course oats and milk alone is an unappetising way to start your day, but the beauty of overnight oats is in the tasty toppings and additions. 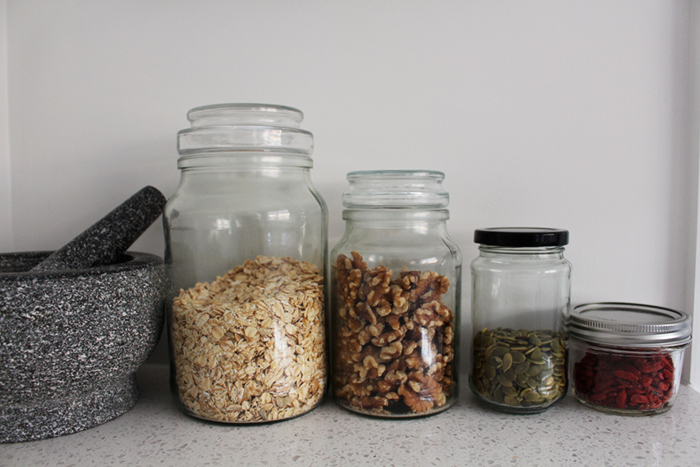 Mix it up every morning depending on what’s in the pantry – whatever nuts, seeds, milk or fruit you have on hand – the skies the limit! 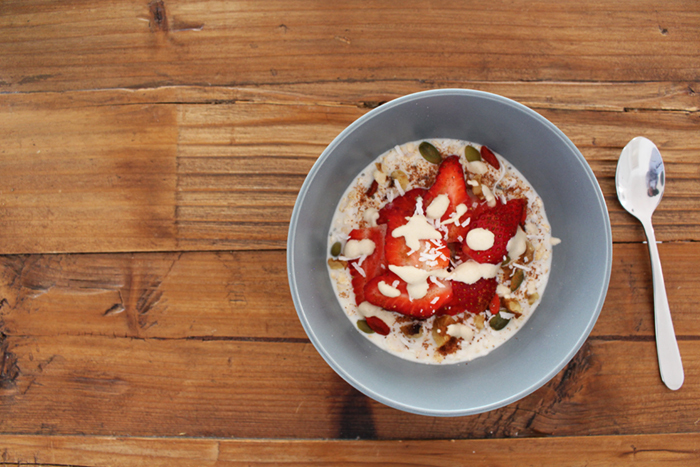 To help you kick start your new overnight oats addiction, I’ve given you a little insight into how I add pizzazz to my morning oats. 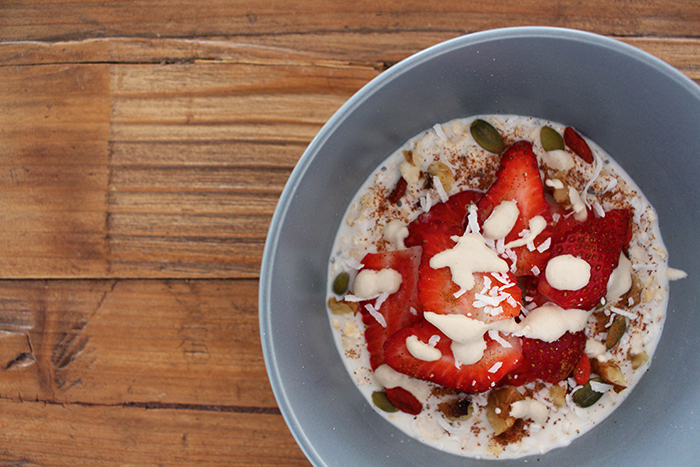 Place all ingredients except for the fresh fruit in your favourite breakfast bowl. Cover and place in the fridge. Go to sleep, wake up excited for breakfast and grab your bowl from the fridge. Top with fresh fruit and any additional tasty treats, take a sneaky photo for Instagram and enjoy! To change it up, add some of the ingredients like nuts and goji berries in the morning, it will give it a whole different flavour and crunch factor. 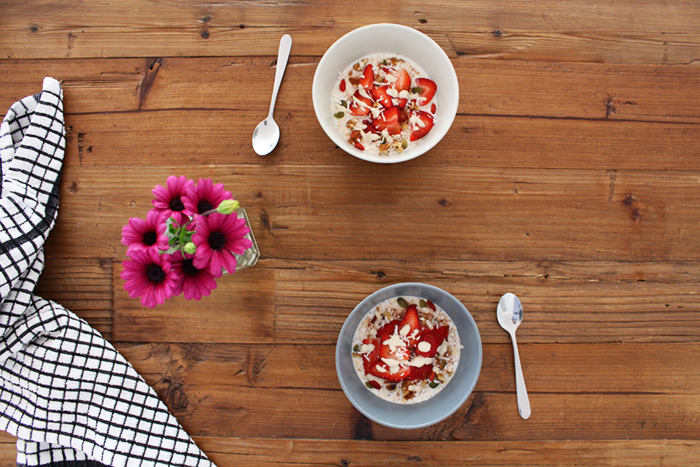 Share your favourite weekday breakfasts in the comments below! First off big fan of your blog but I had one quick question for you.